The family in Hraunkot farm had almost forgotten about the lamb with the peculiar horns, born last spring and left with its mother to the mountains to graze. A part of their flock has been in the mountains since then and when herders went to look for them and fetch the heard last Christmas they didn’t quite know what to make of the strange animal trough their binoculars. The Icelandic sheep breed exist in both horned and polled strains, most commonly it has two horns, some strains have four horns and some even five. A one horned sheep is very unusual to say the least. The herders thought it might be a big buck goat that had somehow found its way to the flock. The one-year-old sheep’s horns are grown together and intertwined upwards, creating one thick horn that splits at the top. The ram promptly got the name Unicorn and such an animal has never before been seen in the region. Older neighbouring farmers make a trip to Hraunkot to see the wonder. “We think there is some sort of geological mutation causing the horns to grow in such an unusual way” the farmers at Hraunkot told a reporter from Morgunbladid. “Its parents didn’t have four horns or anything like that. There are no four horned sheep in our flock, so it didn’t inherit any such genes. It’s simply a unique animal and our neighbours have made the trip to come up here and visit to have a look. Noone has seen such a phenomena and they don’t have any particular theories as to how or why this happened” they go on. The ram is simply unique from nature’s hand. On top of that he has special facial features, his eyes are unusually wide open as if the horns stretch the eyelids upwards. “It always looks slightly surprised or sad in expression”. The family goes on to inform that it’s an intelligent animal. “We noticed the peculiarity of it’s horns when it was a new-born, but it wasn’t an hindrance, it found a way to suckle it’s mother and now has found a way to bend it’s head sideways to get to the hey. The sheep houses are not designed for unicorns, so he has do a bit of adjusting.” They also tell the reporter that Unicorn is a calm sheep with a good-natured spirit. 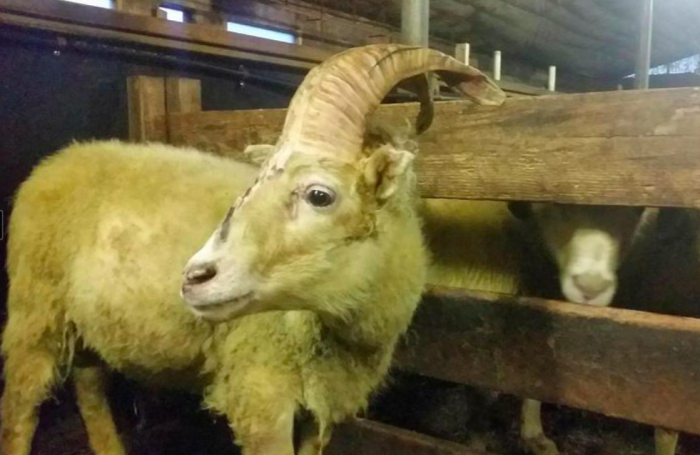 “He’s harmless, poor thing, the rams are sometimes fighting and establishing dominance in the stall and they sometimes pick on him, maybe because he’s different. He has a bit of a scrape on his forehead now from a brawl in the stall last night” they go on. Even if the children and the family have taken a liking to their young unique unicorn, he will not be allowed to live. “He will be allowed to live to next spring so he gets one extra summer. He’s obviously not a good breading sheep, he is skinny, and doesn’t do to well in terms of health, he’s rather frail. The family reads unicorn stories together at night and are looking forward to one summer with their Unicorn on the farm.